Hardboard is a traditional board used for floor covering and the leveling out of old wooden floor boards. It gives a clean smooth surface which allows you to apply various floor coverings of your choice. One face is smooth while the other is coarse and textured which helps to secure the board to the substrate. It is normally very easy to work with using conventional wood working tools. It also offers flexibility due to it being thin, making it suitable for projects where you might need the board to have slight flexibility. 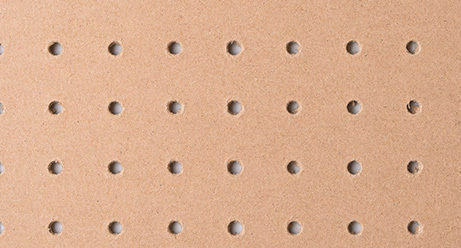 Perforated hardboard is smooth one side with a mesh pattern reverse, uniformly perforated across the whole board and is used for furniture, acoustic construction and in the shop fitting industry. Lion hardboard is manufactured entirely from wood without potentially harmful glue or chemical additives. There are many possible uses for Lion boards, in addition to traditional furniture and building applications. All panels are processed in accordance with (EN 622-2).